1. To reveal the presence of apparent anomalous forms within a blood sample. 2. To demonstrate a modification of microscopic technique that uses a laser light(see caution below) to emphasize those same irregularities within the blood sample. 3. To extend these same observations to a broader sample of individuals (5) to discover if the abnormality may be more widely distributed than is known. 4. 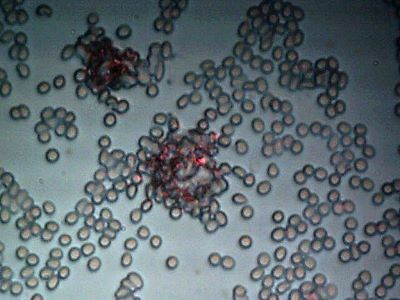 To examine the blood of an individual with Morgellon’s in comparison to the broader sample of five individuals. 5. To suggest a line of research that could be pursued with respect to the Morgellon’s condition. 6. To once again appeal for immediate assistance from the general and professional community to address the discoveries that have been made. This paper will be dominated by the presentation of numerous photographs from the microscope. This information is being advanced without extended discussion or analysis because of the urgency to make the information available to the public. I would encourage the reader to follow the progression of photographs carefully and to make comparisons through to the end; the last set of photographs does introduce the Morgellons issue as a significant part of this report. The proper analysis can be made only when sufficient resources are applied to to this situation and I do not hold any special position to accomplish that end. 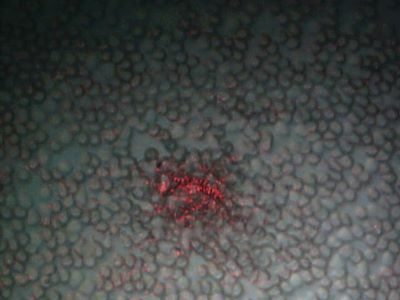 It was found during the inspection of the fibrous sample from a second individual with the Morgellons symptoms (see Morgellons Morphology Confirmed, Nov 2007) that a laser light was valuable in highlighting the internal structure of that fiber. Please note the numerous micron to sub-micron structures that become easily visible as shown in the last photograph of the report just mentioned. 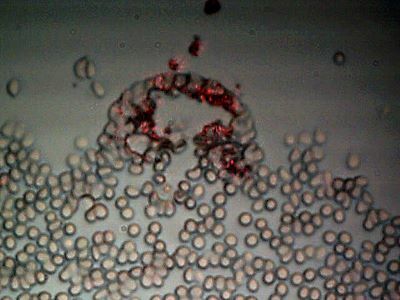 It was decided to subject a blood sample to this same microscopic technique; this sample was NOT from the individual with the Morgellons’s condition. 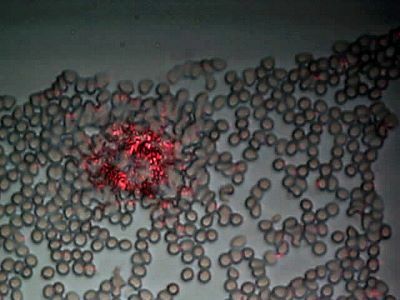 This was done as an exploration to examine the effect of the laser under different conditions and on a different sample. The important findings from this work were twofold. First, it was found that the laser light (650nm) brought several areas of “irregularity” within the blood sample to a bold prominence. Approximately two to three of these variations were found within the sample. It was found that the laser light allowed for rapid scanning of the sample, and that variations in the uniformity of the blood sample were easily and immediately detectable. As a general principle, it may be found that this method has many applications beyond that being filed here. In retrospect, these variations are also visible under normal lighting, but they can easily be passed over with an untrained eye. The second finding was that structures of the same style and shape (sub-micron) as reported in the Morgellon’s fibrous sample are also appearing in the irregular areas of the blood sample being described. Until the structures are positively identified in both cases, the importance of this cannot yet be established. It does, however, point out the immediate need for identification that I have stressed in the previous report. This same need now extends to blood sampling. 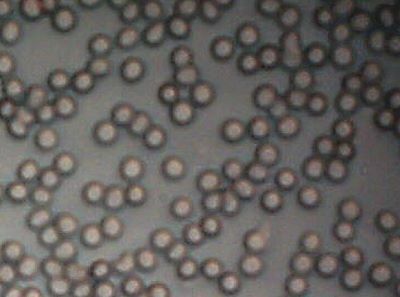 It may be found that the variations shown here are quite explainable in the ordinary sense of microbiology; if and when that comes to pass this report will include that information. For now, the need is for serious work to be done on both accounts. in addition to conventional bottom up stage lighting. No unusual variation in form or structure apparent. Subject No. 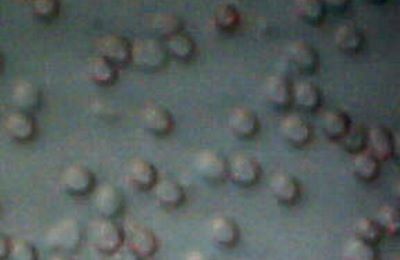 1 : Anomalous variation in blood cell structure. Highly visible with use of red laser light. Subject No. 1 : Same anomaly under normal visible light. Much more difficult to detect without the use of the laser light. Subject No. 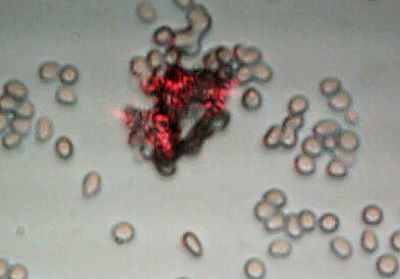 1 : A second anomalous form within the blood sample under laser. 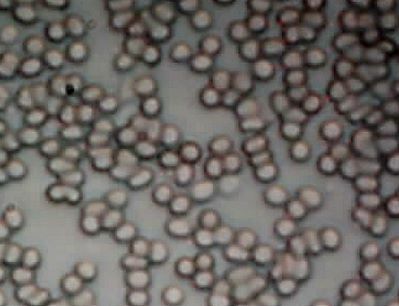 Granularity within the abberation can also be seen; this measures at the micron to sub-micron level. 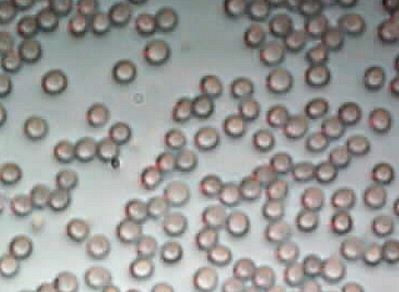 Similar in nature to granularity within Morgellons fiber as already reported. Subject No. 1: The second anomaly observed under normal visible light. Subject No. 1 : A third anomalous form within the blood sample under laser. 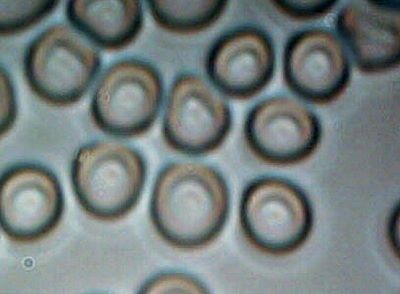 a fibrous ring like structure that is external to any blood cell morphology. Highly visible and easily detectable under laser view. Consideration of a fungal nature may wish to be considered at this stage. Subject No. 1: The same third anomaly under normal visible lighting. Subject No 1 : A highly cellularly disturbed region of the blood sample. Erratic structure is again emphasized and more easily detected with the use of the laser. Subject No. 1 : The highly disturbed region under normal visible light. The previous photographs make apparent the two findings that have been outlined in topics one and two of this report. Several additional questions now arise from this work: first, what exactly is the anomalous form that is being observed? 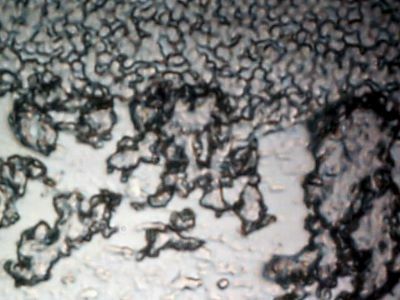 Second, is there any relationship between the sub-micron granular nature of the blood anomalies with the apparent similar granular nature of the Morgellon’s fiber as it has been previously observed and reported? What is the nature of the fibrous form that emerges in the photographs from set three above? 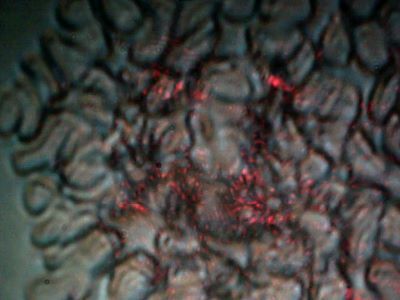 Is there any relationship between this apparent sub-micron fibrous blood anomaly and the sub-micron fibrous nature of the Morgellon’s condition? 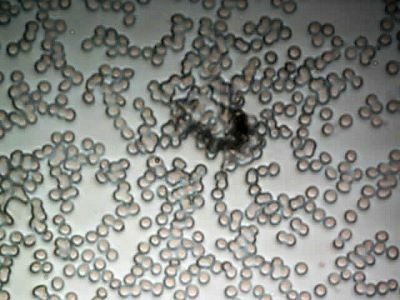 Is there any relationship to the airborne fibrous samples that have been refused by the Environmental Protection Agency for identification? Is there a fungal nature involved in the photographs that are presented here? If not, what is the form that is being shown? Is the form unusual or unhealthy? Fungal or bacterial infections in the blood are not a normal or healthful condition, and this is one reason the consideration must be taken seriously. And lastly, are the anomalies being observed here unique to this particular blood sample, or is this a more widespread condition? The answers to these questions are to be found from those who will choose to help in this pursuit. In the meantime, some further progress can be made on the last question that has been proposed – does this condition extend beyond this particular individual? Topic three of this report is now relevant. Blood samples have been collected and observed from four additional people that have no relation to the previous presentation. With one exception, this extended sample can reasonably be considered as a random set. The general characteristics of the sample set are that they are of adults, approximately of age 40 or greater. Three males and two females have contributed to the test. The important exception to the above is that one blood sample is from the subject that exhibits an advanced manifestation of the Morgellon’s condition; the same individual that has unselfishly contributed to the paper Morgellon’s Morphology Confirmed, referenced previously. The observations from this individual will be presented at the end of this report. The finding is that all five individuals tested show this same anomalous form within the blood of each. The degree of presence varies, but all of the individuals observed display the same identical form and structures within the blood. Only one of the five individuals(subject 5) is known to be outwardly manifesting the Morgellon’s symptoms. The comparison of the Morgellon’s condition will obviously be critical in any analysis of these findings. If it is any “normal” condition, it will have to be proven as such. The varying conditions of the blood samples at this stage indicate anything but normal from the perspective of this researcher. Again, I do not claim or offer any position of medical knowledge or expertise on this issue; I do offer a set of observations that I regard as important for you to consider. The following photographs from three distinct individuals will show several microphotographs for each. 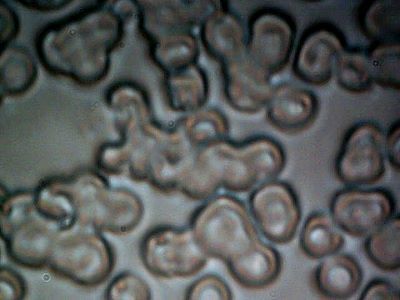 The first photograph will be of the most uniform cellular structures that can be identified within the sample. The second will be the anomalous form that reappears in each of these distinct samples, subject to laser light. The last will be the anomalous form under normal visible light, similar to the outline from above. Subject No. 2 : Female Age 59 Years. Subject No. 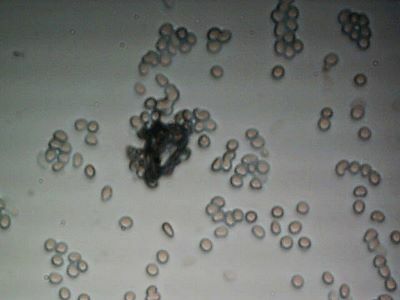 2: Similiar anomalous form found in blood sample. Subject to laser; laser greatly assists in detection of anomaly. Notice apparent destruction and cellular damage in vicinity of detected anomaly. Subject No. 2 : Same anomaly under visbile light. Subject No. 2 : Second anomaly under laserlight. Notice the fibrous nature appearing again, similar to that of subject No. 1. Subject No. 2 : Second anomaly under visbile light. Subject No. 3 : Male in mid 60’s. Subject No 3 : Significant anomalies observed. similar to that described for subject no.l. Subject No. 4 : Adult Male > 40yrs. 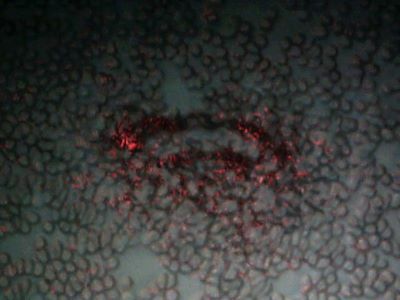 Subject No 4: Anomaly within conglomerated cellular structure, subject to laser. Single structure of interest was identified within this particular sample. All other subjects show multiple anomalous structures. Sample may have had tendency to conglomerate more than in others. under normal visible light. Magnification 750x. 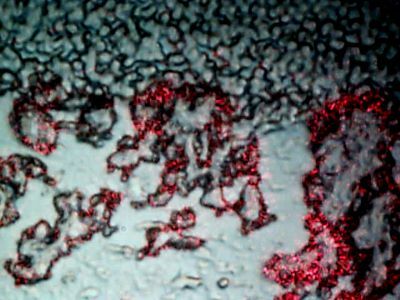 We now consider topic four, and this is the condition of the blood of the individual that displays the more pronounced symptoms of the Morgellon’s condition, including the presence of extraordinary fibers on the skin surface. 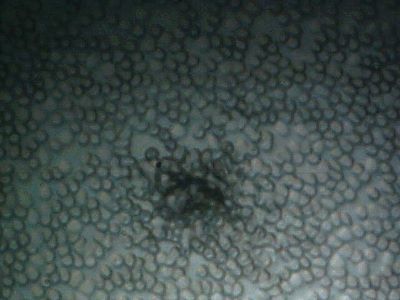 Several samples of these fibers have now been observed and reported on (Morgellon’s Morphology Confirmed). Unfortunately, the finding here is that the blood of this individual exhibits without question the greatest prevalence of these anomalous structures, along with the most pronounced degradation in cellular integrity. 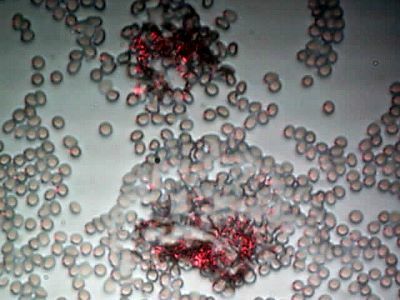 This determination forces the important question as to whether or not there is a relationship between the impact upon the blood reported here and the existence of the Morgellon’s condition. 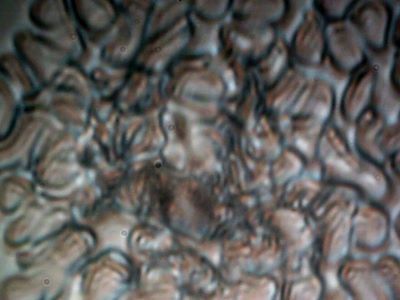 In addition, the prevalent theme of remarkable sub-micron fibrous structures from environmental airborne samples to skin samples and then again possibly to blood samples must obviously be examined to the greatest detail. I again offer my most heartfelt gratitude to the individual that has made this information available to all us. This has been done in the most generous, kind and unselfish manner that anyone could ever hope to offer. I pray that you will use this information to fulfill the intention that has been given to you from this individual. There remain many mysteries within this subject, but none of them are any excuse for procrastination. As you may see, help is needed. It is quite possible that this help is needed much more broadly than any of us know at this time. I have no desire or will to be alarmist in any of my methods; I am providing what I see to be a factual and rational account of most extraordinary events and risks that befall us. I request that you distribute the information on this page and others before it. I can make no promises for the longevity of this website. If you value the information that is available through this research site, I would recommend that you protect and distribute this information to your own satisfaction. Subject No. 5: Female Age 59 years. 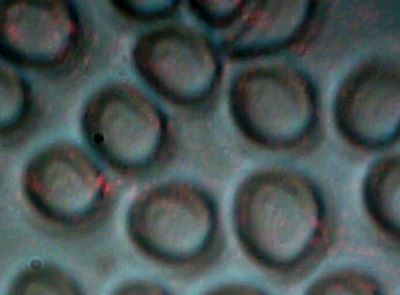 Normal cellular form and structure appear to be intact here. This individual shows advanced symptoms of the Morgellons condition. 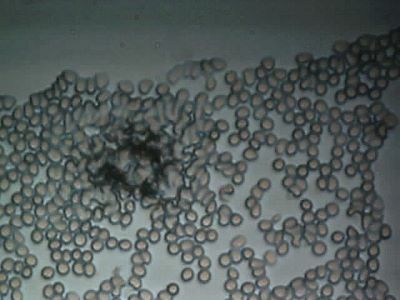 Uniformity of this nature was rare within the blood sample. Strong degradation of cellular form and integrity appears to be evident. This observation is typical of the blood sample. easily the most numerous of the subjects that have been considered. Broadly distributed throughout the sample, easily detectable with laser. Subject No. 5 : The same anomaly as above subject to normal visible light. Notice again the apparent degradation of cellular integrity adjacent to the structure. Subject No 5: Second anomaly. Subject to laser light. and conglomeration are common to the blood sample. Subject No. 5: Second anomaly subject to visible light. Subject No. 5: Third Anomaly. Notice cohesive structural form. Subject to laser. 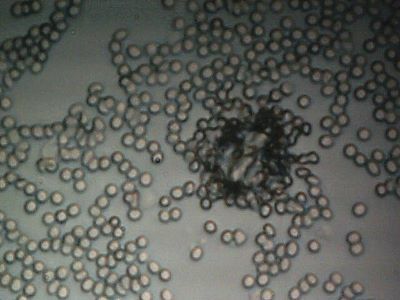 Magnification 750x. Subject No. 5: Third anomaly subject to normal visible light. 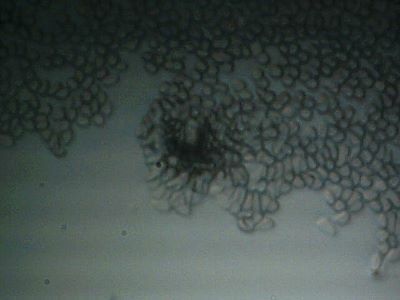 Numerous other anomalous structures exist within the sample. Subject No. 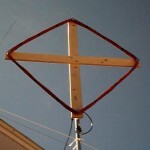 5 : Fourth anomaly; double structures evident. Subject No. 5: Fourth anomaly, normal visible light. Subject No. 5: Extensive areas of the sample appear to suffer degradation. Conglomeration of cells appears throughout sample. Subject No 5: Cellular structure no longer apparent in this region. Subject to normal visible light. 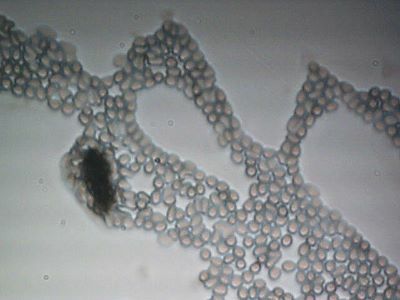 Magnification 750x. As time is short for now, the parting comments here will be brief. It is quite clear to me what work needs to be done. The main question that remains is who is going to help to get it done, when are they going to do it, and to what ends are they going to serve? I will do my best to avoid drawing any premature conclusions on the nature of what is being described in this and previous reports. I believe that the photographs presented during recent days speak quite well for themselves. It does seem clear, however, that certain critical issues have been deliberately avoided; to what end only time may tell. I am not making claim on what the nature is that is being shown here; I am making claim that we all need to know what that nature is as quickly as possible. I will offer a suggestion, and it only a suggestion without warranty. It does seem reasonable to consider that a fungal nature(fungemia) or a modified fungal nature may be involved; this has been alluded to earlier and is in keeping with many of the health symptoms that we have been witness now to for many years. It is quite conceivable(and not unexpected) that even more exotic methods of biology or artificial constructs are involved with the Morgellon’s issue; that too will have to find its way in proof that is apparent to all. For the time being, the strongest point that I can make is to continue the appeal that has been in place close to a decade. This is for all of those that care about the humanity, life and welfare of this planet to make their mark on reclaiming what is rightfully ours. This includes the divine rights of existence beyond the machinations of mankind and the power structures that continue to mar history. We can start this quest by reclaiming our health and the health of this planet, as they are both gifts for us with responsibilities attached. The role of stewardship is ours if we only care enough to exercise it. DO NOT USE LASER LIGHT IN ANY WAY WITH DIRECT EYE OBSERVATION OR MIRRORS. LASER LIGHT IS A SIGNIFICANT EYE HAZARD. EXTERNAL DIGITAL OBSERVATION TECHNIQUES ONLY.